Sonos adds Aupeo and Stitcher internet radio | What Hi-Fi? Sonos is boosting its internet radio offering with the addition of Aupeo and Stitcher web services. 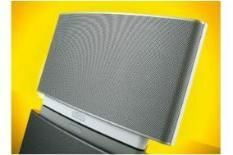 Sonos systems are already compatible with Spotify, Napster, Last.fm and Deezer. Owners can now add Aupeo and Stitcher. Both are free. Aupeo is an internet radio platform that lets you stream from around 100 stations. Users can search for a specific artist on Artist Radio, or make their own personal radio station using the 'Love' and 'Ban' buttons. Aupeo's Mood Selector even creates stations to match your mood. The standard version with advertising is free, and Sonos owners also get a 14-day free trial of Aupeo Premium with no ads and higher audio quality. Stitcher is a free podcast and radio service that stream more than 5000 radio stations, podcasts and shows. Listeners can choose from the latest news, comedy, sport, talk and entertainment programming. You can even 'stitch' together your favourite shows to create your own playlist or tell Stitcher what you like aand it will recommend even more.